​Magazine Covers, Book Jackets, Catalogues, and Press Folders. Our standard finishes are Gloss, Matt & Silk, we also stock Soft Touch, Anti Scratch Matt and Bio- Degradable in both Matt & Gloss. We stock some Textured & Holographic designs but these items, in general, would require a special order. We can laminate all sheet sizes from 320mm x 225mm up to 1400mm x 1040mm and sheet weight from 90gsm. Wiro Binding We can offer all forms of wiro binding. With 2 x Polar 115 Guillotines feeding our automatic collating, punching & binding lines we have the capability to bind up to 2500 books per hour. Useful for Binding Documents, Calendars, Diaries and more. Styles range from Standard Wiro sizes A6 up to A2 Portrait, Desk and Wall Calendars both Corporate & Retail, Half Canadian and Concealed Binding. Our Spot UV (ultra violet) processes can be used on many printed materials such as brochures, flyers, book covers and business cards allowing specific areas to be enhanced and improve product impact. Normally these areas are Gloss varnished, we can offer a number of speciality finishes such as Matt, Tinted, Hi-Build, Glitter (Sparkle) and Textured (Sand). Our Sanwa flatbed cutting & creasing machine is capable of producing a variety of processes: Creasing, Perforating, Kiss Cutting, Die Cutting & Embossing. With the facility for Auto-Stripping and the ability to run material from 120gsm to 1500 Micron, working from sheet size from 320mm x 450mm to 720 x 1020mm, makes it the ideal machine for the full range of commercial die cutting. For smaller format work we also have 2 x Heidelberg Cylinders. We can now offer foiling at our Dartford factory as we have installed 4 x Foiling Machines, capable of running from A4 - B2. See Foiling page for more info. Our Horizon book binder BQ-470 is capable of binding books A5-A4 Portrait & Landscape with a maximum spine width of 50mm and operating speed of up to 1,350 books per hour. The specification of your job may require an element of hand finishing. Our Skilled Bench Workers allows us to keep control right up to the finished product. 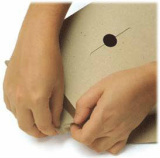 Our Hand Finishing includes Drilling, Binder Fulfilment, Hand collating, Hand Folding, Glue dotting, Velcro dotting, Chrome Studs, Taping and much more. ​Please contact us with your specific job requirements. The Moll Gluer is ideal for long runs it has enabled us to move into new markets, offer our clients a more complete service and at the same time keep control of quality and timing. We are able to produce mailers, cartons, pocket folders, envelopes and various Multi Media Packaging. We have a 14 Station Collator and a 24 Station Collator, we can collate sizes from A6 up to B3.